Without a doubt, the leading contender for The SEMA Show’s Hottest Car award next week is the 2015 Mustang. As you read this, aftermarket companies across the country have finished or are finishing custom S550s for the aftermarket’s biggest show. We are bound to see a lot of flashy rides on the show floor, but one that will make a statement at SEMA and on the racing circuit next year is the creation of Watson Racing in Brownstown Township, Michigan. Watson Racing set out to create the ultimate street/strip ’Stang, balancing power and weight reduction with safety and creature comforts. That’s the new MVS/Watson Racing 3-inch cowl induction hood built from carbon fiber. If you don’t follow Mustang racing closely, the Watson name might not immediately resonate with you, but rest assured they have been at the forefront of this racing scene since the heyday of the Fox. From creating the late Steve Grebeck’s legendary SAAC drag ’Stang to building one of the first supercharged, Four-Valve modular race cars (before Terminators existed), Watson has been there. These days the company is at the forefront of S550 racing development. Sure a Coyote is powerful, but for drag action Watson Racing amplified its howl with a Ford Racing TVS supercharger, a Ford Racing throttle body, a Ford Racing mass-air housing, and a set of Ford Racing camshafts. With a push into the aftermarket world, it’s only natural that the Watson team would sign on to re-create a 2015 Mustang for the big show. While many cars are built to cut through the noise on the show floor with flash, the Watson S550 is brimming with substance. It is this serious level of performance that will allow this GT to fit in at the show and run hard at the track. Of course, Watson fit the interior with its roll cage, but it also added a number of race-ready improvements, including dash-mounted Ford Racing gauges, Sparco Evo 3 race seats, an AIM GT350 steering wheel, Teamtech harness belts, and more. The custom interior touches are courtesy of SPC Interiors. Likewise, many projects make a big splash in Vegas only to fade away as the show’s echo fades into the holidays. That certainly won’t be the case for the Watson Racing 2015. Not only will this car tour the show circuit, it will compete on the quarter mile at the highest level. Wouldn’t it be cool to see this beauty run in Coyote Modified? For now, however, let’s take a look behind the scenes of its creation. As you can see, Watson Racing tore this 2015 Mustang GT down to a shell and built it back into a race-ready machine. The craftsmanship is stellar, and it should be fun to see it run down the 1,320. What began as a basic, black 2015 GT became this stunning street/strip ride wearing custom paint by Ice Nine Customs. The rear trunk trim is from Ford Racing, and the battery cut-off switch is from Moroso. 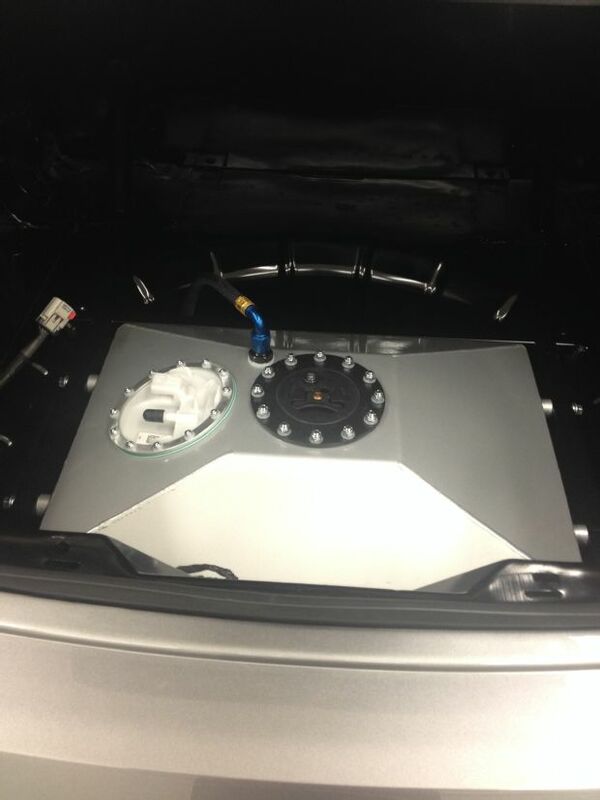 In the trunk rests a Watson Racing 10-gallon fuel cell and a trunk-mount battery kit. If you were at all concerned about drag-worthy gear for the S550, check out this automotive art-work. Watson A-arms and Strange struts are ready to do work. Here they are test-fitting the 17×4.7-inch Weld Racing front wheels. Here’s a look at the complete install. The Ford Racing-boosted Coyote rests in the coated K-member. At the front, you can see the massive AFCO heat exchanger, which will tame the blower discharge temps. Inside the wheels are lightweight Strange race brakes. As nice as the Watson Racing Mustang looks up top, the underside is what gets our blood pumping. This exhaust system is the stuff of gearhead fantasy. A pair of American Racing Headers long tubes feeds an ARH X-pipe, and from there the exhaust has two options. On the street, it will exit on the side through Magnaflow mufflers. On the track, it will take the path of least resistance through the open Pypes electric cutouts. Want to know what a drag-prepped IRS should look like? This is it. Watson says this car is ready to run 9-second e.t.’s. It wears Ford Racing springs, Ford Racing heavy-duty half shafts, and Ford Racing heavy-duty IRS bushings. Like the front, the rear is also equipped with lightweight Strange race brakes and Strange dampers.